Manufacturer of a wide range of products which include Series Granulators, Rsp 26 & 30 Series Granulators and Granulators. RN 20 Series low speed granulators, characterised by a 200 mm diameter with multiple staggered blades and 300 and 450 mm length. A version with open rotor for the recovery of blow moulded sprues is also available. Open-type rotor granulator designed for recovery of defective pieces and sprues in a closed circuit beside the injection moulding machines. Rotor with a 260 or 300 mm diameter and length ranging from 350 mm to 450 mm, with multiple staggered knives featuring scissor-like cutting action. 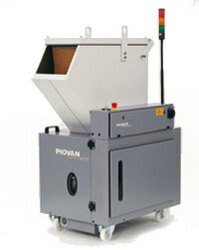 > the internal design of the hopper improve the cutting performance, with less energy utilisation. no dust and uniform size, thanks to the rotor design. blocking safety device to prevents any risk of accidental contact. Designed for recovery of defective pieces and sprues in a closed circuit beside the injection moulding machines. Rotor with a 150 mm diameter and length ranging from 150 mm to 375 mm, with multiple staggered knives featuring scissor-like cutting action. > two lateral discs running with the rotor, to eliminate friction of the material to be ground against the chamber sides, avoiding deformation from stress. Open-type rotor granulator designed for recovery of defective pieces and sprues in a closed circuit beside the injection moulding machines. Rotor with a 200 mm diameter and length ranging from 200 mm to 450 mm.